I'm also considering an R8 manual but my heart says replace the 996 Turbo and my head says keep it. I'm considering two, a mug blue manual car with no mag ride and the purple car with buckets, two different end of the price scale. I want the purple car because of the buckets and the mug blue car because of the price. Now I have a solid offer on my Turbo I think it's finacially at least a bad idea to swap yet keeping both is a bit extreme as the RRS would have to go and we've just got a 2nd dog! Current - B7 RS4 Avant Ceramics, Merc 560 SEC, Merc E320 Sportline Cab, Caterham Supersport race car, Toyota LJ70 LC. Bund wrote: I'm also considering an R8 manual but my heart says replace the 996 Turbo and my head says keep it. If they were the same price I'd take the V10 but I won't even wring the neck of the V8 so paying up for a V10 is pointless to me. I'm not looking to pay the 53 the purple car is up for either. Will the turbo be more fun than either? I doubt it will be as you have to be doing some serious speed to get the joy from it and It doesn't sound anything to me. I've done 1700 miles in 20 months so I hardly know the car. I just think the R8 is better looking. From a financial point I think it's at a better stage in the cycle than the R8 and I think they will be perceived better when the mileages start to get into "supposed high" category. The R8 will be more fun to drive as the 996's turbo lag just take the fun away. The Porsche is a great car you can use every day and has great acceleration, other than that it's a bit bland. In fact, I used to enjoy driving my E46 M3 more than my 996 turbo. As for the V8 R8, the back end is a lot more lively and sounds awesome with a aftermarket exhaust, but there are a few things you need to watch out for. Magnetic Ride is very expensive to repair and if the air conditioning compressor fails, it's engine out to replace. Financially, Porsche prices are very strong at the moment, but the R8's depreciation is not bad either. At the end of the day, it's down to what's important to you. Im going to try and see the purple car today. The R8's depreciation being not bad, are you taking that as for sale prices with dealers or you know this first hand? I ask as I haven't seen the private car adds coming down and to be honest most of them look expensive to dealer pricing. Do R8's have a good private market like Porsche? Now WBAC is just an auction bid(but one we can all access to gauge a price) but i couldn't believe how low it was compared to some cars, they even bid a spyder cheaper than a coupe albeit the spyder was newer with less miles yet more owners. Im talking £24k cheaper than someones private £57k spyder yet a dealers coupe was bid 33.5 vs offered sale price of 41. I literally cannot buy an R8 in the spec I want privately and haven't been able to since I started looking. Extended leather and buckets. The rest I'd forgo. 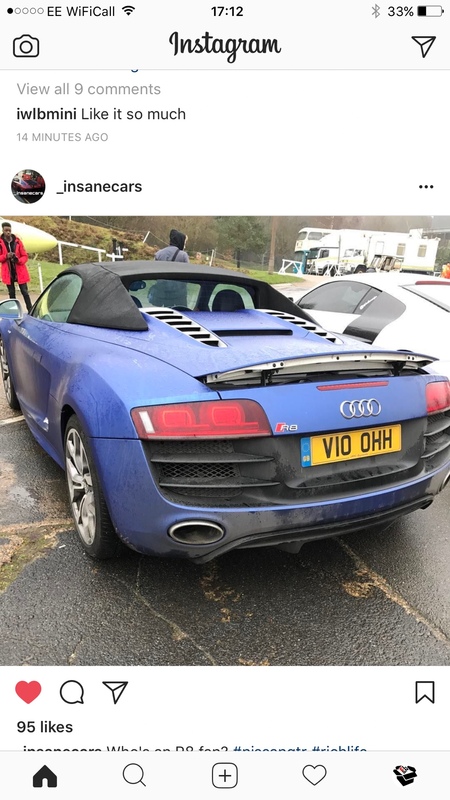 My mate has a V10 spyder and last of the manuals white with blue roof but currently wrapped matt metallic blue. I'll try and find photo if your interested? Is that the one I’ve driven past a million times on a back road near Tunbridge Wells?